Crabber David Bailey, who skippers the Morningstar II, is rattled by the news. He remembers a hypoxia event out of Newport, Oregon, about a decade ago. He says it shows up "like a flip of a switch." "It shows up like a flip of a switch," he says. "If there are crabs in the pot, they're dead. Straight up," Bailey says. And if you re-bait the pots, "when you go out the next time, they're blanks, they're absolutely empty. The crabs have left the area." A hypoxia event will kill everything that can't swim away—animals like crabs, sea cucumbers and sea stars. "We can now say that Oregon has a hypoxia season much like the wildfire season," says Francis Chan, co-chair of the California Hypoxia Science Task Force. "Every summer we live on the knife's edge and during many years we cross the threshold into danger – including the past two years," Chan says. "When oxygen levels get low enough, many marine organisms who are place-bound, or cannot move away rapidly enough, die of oxygen starvation." The hypoxia season hits Oregon, Washington and California waters in the summer and can last from a few of days to a couple of months. Some years it only affects a few square miles of ocean; other years it's thousands of square miles. "These reefs that used to be full of rockfish, they were all gone and a lot of the marine life: the sea stars, the sea cucumbers. They were dead," says Chan. "One of the more fundamental reasons is that the ocean is warmer now and warmer water holds less oxygen," says Chan. "And then the second part is that a warmer surface ocean, it acts as an insulating blanket." Scientists say climate change is behind this. The ocean has been absorbing nearly all the rising heat from greenhouse gas emissions, and it's projected to grow even warmer in coming decades. Other factors may be contributing too. 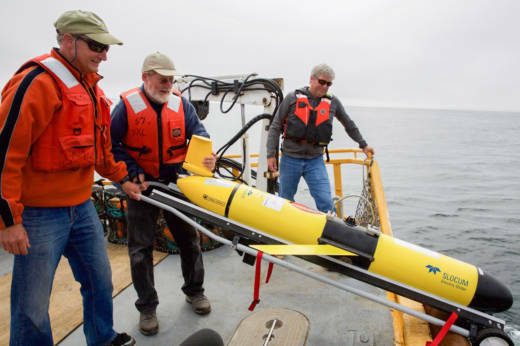 Oregon State University oceanographer and co-chair of the Oregon Coordinating Council on Ocean Acidification and Hypoxia Jack Barth, thinks higher temperatures are also slowing ocean currents. If we could see under the waves, he says, there'd be a lot more concern. "As an analogy, think about the summer when the skies were filled with smoke. Covered the whole Pacific Northwest," Barth says. "When we used to think about hypoxia in the ocean, we think about little areas. But now what we're looking at is...low oxygen all along the coast." Barth is collecting data to draw the first hypoxia maps of Oregon's coast. "We're actually seeing real interest from the fishing community. They know how to look at our data and say, 'Where are the layers in the ocean? Where is the high and low oxygen?'" Barth says. Barth also notes that the crabbing and the oyster industries were ahead of the curve. "They were among the first to notice that the ocean just off our coast is changing and was affecting their livelihoods," Barth says. "And they have been working with scientists ever since." Deep Pacific waters 50 miles off the coast have always been hypoxic. And it's hardly surprising. The water down there take decades to slowly flow thousands of miles from Japan to the west coast — all the while separated from oxygen in the air. "Hypoxia is something we rarely saw throughout the 20th century," Chan says, "but have seen almost annually since the year 2002." The National Oceanic and Atmospheric Administration just issued a grant for about 40 new oxygen sensors to be distributed among crabbers so they gather data where they put their pots. Crabbers say they're happy to hand over the data, but they're not so sure about revealing the locations — favorite crabbing spots are a closely held secret.